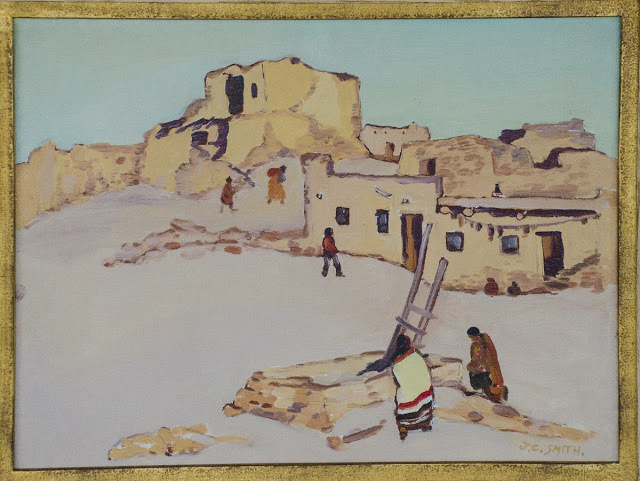 Indian Pueblo oil on board 18 x 24″ Orr’s Gallery label verso. Call or email for price. A landscape and genre painter, John Christopher Smith was known for a clear, bright palette and bold, heavy brushstrokes. In addition to landscapes, he painted people in various recreational and industrial activities. He was born in Ireland and arrived in the United States about 1903. He served in the Armed Forces in World War I and then studied art with Robert Henri in New York City, where he became exposed to Henri’s social realist style of painting. He was briefly in Chicago and moved to Los Angeles in 1920 and became a close friend and sketching companion of Franz Bischoff with whom he painted along the coast of northern California including Monterey, Carmel and Cambria. Many of his paintings from that time also show cityscapes with architecture and plazas with people milling about. He and Bischoff travelled in 1928 to Utah where they painted in Zion National Park. He also painted in Arizona and New Mexico where he did Indian portraits as well as landscape. After the stock market crash of 1929, the closing of the Wilshire Galleries where he exhibited, and the death of Bischoff, he earned his living as an interior designer. In 1943, he at age fifty two died of tuberculosis. Exh: Wilshire Gallery (LA), 1926-28; Pasadena Art Inst., 1927, 1930; Eagle Rock Artists, 1931-32; Nicholson Gallery (Pasadena), 1932. In: Fleischer Museum (Scottsdale, AZ).